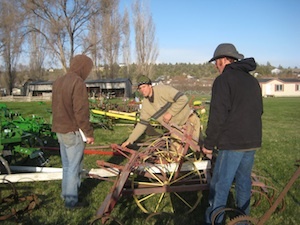 The Washington Young Farmers Coalition hoofed it down to Madras, Oregon this month to the 33rd Annual Horsedrawn Auction and Swap Meet hosted by the Small Farmer’s Journal. Five days of clinics, demonstrations, auctions and the chance to meet horse farmers from around the west sounded like more than we could resist, so we organized a bunch of carpools, packed our tents and headed south. A few of us had been to the auction before, but this was my first time. We stood out not only because we were younger than most but also because very few of us had the seemingly requisite cowboy boots, hats, and dusters (we passed the test on Carhartt gear). No one gave that a second thought though – we were welcomed in like we were part of this great agrarian family, no questions asked. No one was a stranger for long – before I even finished setting up my tent the ‘neighbors’, three farmers from Idaho who brought a beautiful teepee, had come over to introduce themselves and to recommend the pie at the fairgrounds café. One cold windy morning a man with a kitchen in his camper came out to offer us hot biscuits just off the stove. Trust and camaraderie echoed throughout the fairgrounds at this event. While the Jefferson County Fairgrounds were small, the auction itself was immense – it took three full days of auctioning, sometimes more than one auction going on at a time, just to get through all the items brought in. There was harness and tack, old blacksmithing tools, carriages, horse drawn implements, and of course quite a bit of kitsch (coat rack made of horseshoes, anyone?). A few of us even did some bidding ourselves – some friends who are just breaking ground on their own farm bought a seven tined walk behind plow in anticipation of finding their first horse next winter. Teamsters and farmers with a whole lot more experience than us generously helped us check out implements and make decisions about which would be best. You couldn’t turn around here without meeting someone willing to help you out. In addition to the live auctions there were demos, clinics, and a plow match where contestants and their draft teams plowed a marked out square in the field and then were judged by a couple of the best teamsters in the West. 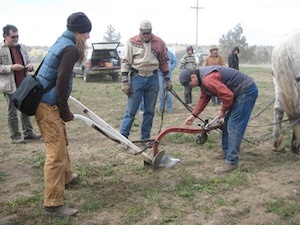 Clinics on CSA’s, irrigation, heritage livestock breeds, schoolyard farms and more gave us a lot to think about, and demos like how to set up a walking plow armed us with some new skills, not to mention a strong desire to try it out for ourselves. 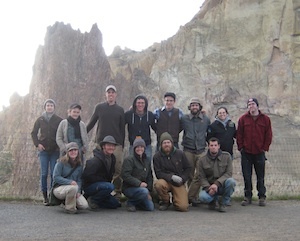 The Washington Young Farmer’s Coalition hosted a well attended round table discussion comprised of young people, mentors, and representatives from the Small Farms Conservancy and Friends of Family Farmers. We told the group a little about ourselves and the work we’re doing and then opened it up to audience discussion. We talked about the experimentation needing to be done on small scale grain production…so get out there and experiment this year, then bring your successes and failures to the table next year! Current bills in the legislature were discussed and notes exchanged on which government officials were supporters. An important point was made that we’re not only going to need farmers for this revolution; we’re going to need blacksmiths, butchers, software developers, mechanical engineers, seed savers and more. Let’s seek them out and inspire them as well! I knew very little about horse farming going into this event. I still know very little but boy did I cram a lot of information into my head in just five days, information I know I’ll use and keep building on. I can’t wait to go back next year!